Laurence Rourke, Roman Catholic, Pay School Income £6. School house an old barn; cost £4. Average attandance: Summer 1824 – males 30, Females 22 Established Church 1, Roman Catholics 51. Not connected with any Society. Scriptures not read. Henry Hogan. Roman Catholic. Pay School. Income £6. School house a wretched hut; cost £1 11s 6d. Average attendance: Summer 1824: Males 25, Females 24; Established Church 3; Catholics 46. Not connected with any society. Scriptures not read. Michael Farrell. Roman Catholic. Pay School. Income £3 School-house a thatched cabin; cost £5 Average attendance: summer 1824 – males 27, Females 20; Established Church 7, Roman Catholics 40. Not connected with any Society. Scriptures not read. John Kerlly. Roman Catholic. Pay School. Income £10. School held in the Chapel. Average attendance: Summer 1824 Males 48, Females 56; Roman Catholics 104. Not connected with any Society. Scriptures not read. Martin Owen. Protestant. Parish school. Schoolhouse of stone and lime; cost £200; built by Government and private subscription. Not yet furnished or opened. In 1954 construction started on a new school in Myshall. Pictures of the opening of the Marian Shrine Myshall actually show the site as a construction site in the background. 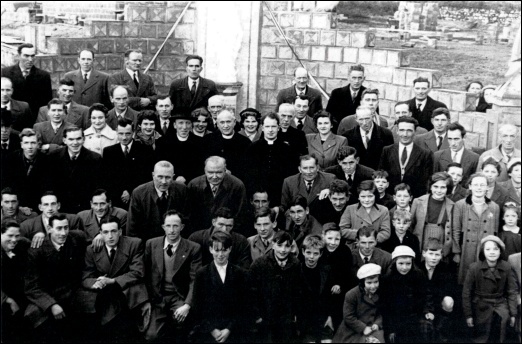 It opened in 1955, built by Mr. Brian Kelly, originally from Co. Offaly, and it opened with three teachers – Mr. Andrew Jordan (Principal), Mrs. Mullen (Vice Principal) and Mrs. Matt Doyle, (Privileged Assistant). 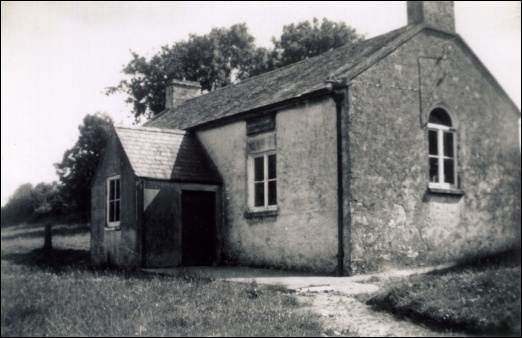 Numbers attending increased as teacher/pupil ratio decreased and by 1974 a fourth classroom teacher was appointed and the Old Barracks, with kind permission of the late Mr. Bernard Nolan had to be used as a classroom. Plans for an extension had been drawn up the previous year. The extension was approved in 1977 and specifications were briefly: two additional classrooms; general purpose room, tarmacadam play area, staff room; the existing three rooms were to be made into two large class rooms and the sewage was to be linked up with the local scheme. Total cost £45,000 with the parish liable for one eighth. The contractor was Mr. Foley, Graiguenamanagh. The four teachers and their classes were accommodated in the Community Centre while the extension was being completed. Children returned to the school building in 1979. In 1985 a fifth classroom teacher was appointed but that post was withdrawn in 1987 as enrolment numbers fell. It was regained in 1989 only to be lost again in 1991 and the school had to wait until 2008 to have that post re-gained only to be lost again in 2009 due to falling enrolment and Government cut-backs.